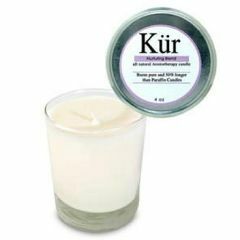 The Kur Soy Candle is made with an all vegetable 100% natural soy wax without chemical additives. It is made with 100% USA-grown soybeans. The wax contains no paraffin, therefore no petroleum. Soy Candles burn clean and have a 50% longer burn time than normal paraffin candles. By brenda s, san pedro ca. i just called your 800 number. chris -( i forgot to write down his last name) was very pleasant and was a wonderful representative for your company. i did not know how to do the tracking. he not only helped me but provided the 800 number to golden state. he also spoke well and clearly. it is nice to speak to an english speaking representative and it is also nice for companies not to outsource their customer service to another country.